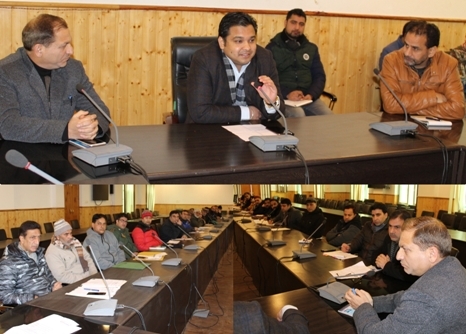 Ganderbal: The District Development Commissioner Ganderbal, Dr. Piyush Singla convened a meeting of officers to review the preparedness for implementation of Gram Panchayat Development Programme (GPDP), likely to be introduced under various flagship programmes/welfare schemes across the district. Threadbare discussions were held regarding the compilation and uploading of Gram Panchayat Development Plans (GPDP) for the financial Year 2016-17, 2017-18, conduction of Gram Sabha for preparation of GPDP under all Government Schemes for the year 2018-19, identification and updation of frontline workers of all line department and sharing their bio-data with District Panchayat Officer and concerned BDO besides sharing of information by the frontline workers and facilitators. The DDC emphasized that all the concerned departments must ready their offices with designated frontline workers to create awareness about their flagship programs through the Gram Sabhas to be held in each Panchayat Halqas of rural areas besides directed all the BDOs to complete the formalities with regard to registration of Frontline workers and block level master trainers for every Panchayat well in time. The meeting was informed that the Gram Sabhas will start in phased manner across the rural areas of the district to listen to the demands of local self-government for the development of all rural areas. On the occasion, DDC said that Panchayats have a significant role to play in the effective and efficient implementation of flagship schemes. He urged upon the implementing agencies, particularly BDOs to demonstrate their desire and commitment in implementing all the flagship programmes/ schemes envisaged under GPDP in letter and spirit so that the benefits reach the targeted population at the grass root level. Among others, the meeting was attended by ADDC Ganderbal, Shafqat Iqbal, ADC Ganderbal, Naseer Ahmad Wani, ACR Ganderbal, ACD Ganderbal, DPO, BDOs and various district and sectoral officers.